In 2012, a friend, Kevin, told me a story that I wouldn’t soon forget. He was serving as a volunteer with Sustainable Bolivia, back when I worked as their Director of Communications and Community Outreach. c/ San Martín, La Cancha. Taken with a Canon AE-1, 50mm f/1.4 lens and expired Agfa film. He lived in a modest home with a Bolivian host family. One afternoon, one of his host brother’s approached him to help plan for a large and lavish party. Once they had identified everything they needed to buy, they set off to La Cancha. 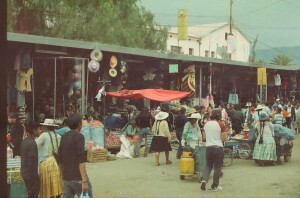 Best translated as “the field”, La Cancha is Cochabamba’s principal outdoor market, and supposedly the largest open-air market in South America. The Cancha is a pretty spectacular place, with a “wealth” of riches that spans dozens of city blocks. Navigating it is always a challenge, and that one thing you’re looking for always seems to be perpetually just two blocks away. Many women in the market will sell only one product, say avocados. Many women selling similar things will stick together, side-by-side. When you come across twenty women together, all selling the exact same thing, you wonder how many of them make enough money to sustain themselves. Sensing a unique opportunity, Kevin’s host brother took him aside and told him he was going to make this lemon vendor’s day. He was going to purchase every last one of her lemons. Well, what the hell would I do tomorrow? Despite the apparent banality of selling lemons, despite the lackluster source of income this must bring, selling lemons was something this woman cherished. I can’t help but feel that there is a sense of camaraderie amongst some of these women in the markets, a mentality that they’re all in this together. Nobody is ashamed of what they do, and they take pride in the fact that they have nailed down something they can do make ends meet. These women are extremely grateful for this opportunity, because in a country like Bolivia, not everyone has these chances. This story reminds me of a beautiful lecture by David Foster Wallace, which was then condensed into a short video, below. Being grateful isn’t just for Thanksgiving. So my question to you is: what are you grateful for today? Right now, in this very instant? Please leave a comment below, and I will gladly share what I am grateful for in return.